Witnessing the vibes of warmth and pleasures of tempting smoked delights, Cuebebar makes a haven for anyone hopping in. Drench in the satisfying scrumptious atmosphere. bikes adding to the ambiance, Cuebebar is Goa’s first official smokehouse. Along with big names like Soro and Escobar as neighbors, Cuebebar is slowly gathering people’s attention, all thanks to its great food and warm hospitality. Arjun, a young lad of 23 years who worked with Marriot, Texas before returning to India, along with his friend Bunty are the two men behind this amazing place. Being very particular about the smoking techniques, the boys didn’t buy a smoker, they rather converted an old tank into a customized smoker and all meats are smoked for a minimum of 6-8 hours to get the perfect smoky flavors. And not just meats, even the veggies are smoked and have some great options on the menu, for vegetarians too. Their specialty lies in their burgers with typical American sized portions and those are definitely worth drooling. While you wait for your order, ask for their signature cocktails and see them shake up some fulfilling drinks to go with your food and also binge on their homemade chips that are crisped and flavored. Our recommendations would include the smoked beetroot salad; it is love. The orange vinaigrette does full justice to the sweetness of smoked beetroot and the goat cheese balances the flavors perfectly. 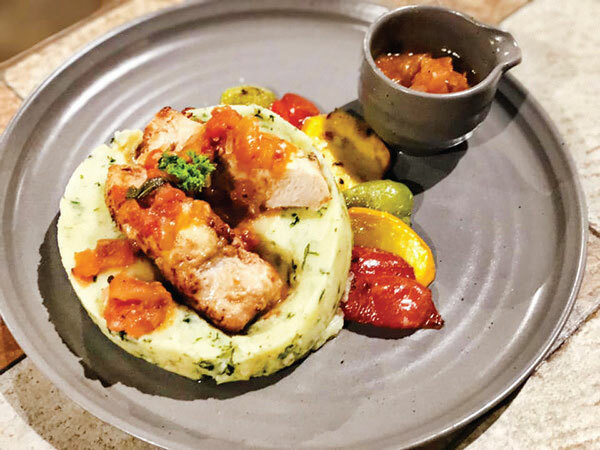 Orange Brined Chicken served on a bed of creamy mashed potatoes, served with roasted and smoked veggies makes for an interesting dish. The tanginess of orange chicken is perfectly balanced by the creaminess of mashed potatoes and this serves as a wholesome meal. The Cuebebar style smoked beef burger is one of their signature dishes and surely calls for a trial. A perfectly smoked and juicy beef patty placed on a soft bun, loaded with pickles, homemade bacon jam, a fried egg on top and handful of chips on the side, this one is messy to eat but totally worth the mess. For those who do not want to fill their tummies up with just one burger, try their slider platter. It will not only satiate your burger cravings but also allow you to taste 3 different types of mini burgers, which you can choose. Pulled Pork, Beef Brisket, and Flame Grilled chicken makes for a great selection in the platter. This place surely calls for a visit and is perfect to satiate those burger and grill cravings. The only downside is that they do not open for lunch yet and are closed on Tuesdays, otherwise regular gigs, stand-ups, movie nights and other events keep this place lively enough to visit anytime of the week for a scrumptious supper.